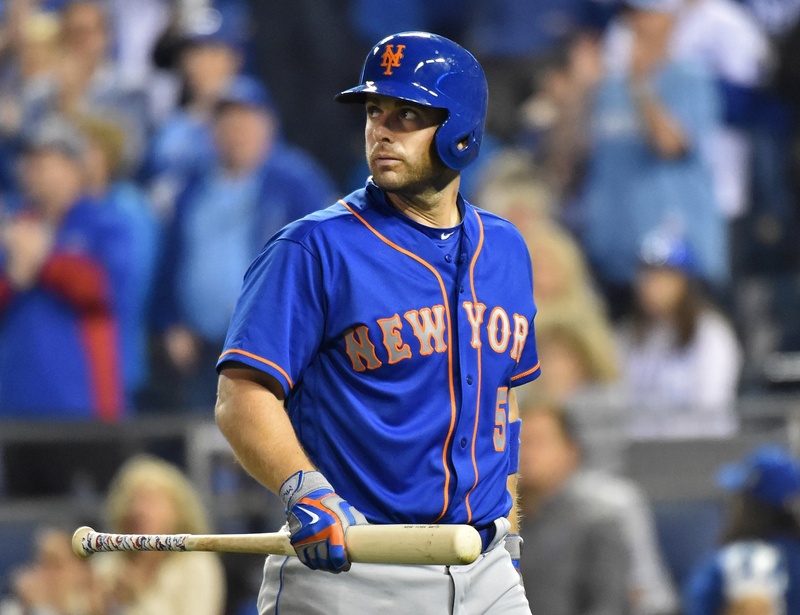 There is little doubt that David Wright, battling spinal stenosis, is the Mets’ biggest X-factor this season. The range of reasonable outcomes for his season is huge, with 130 games and four-ish wins around one end if all of the exercises and planned off-days work like a charm. On the other hand, there’s “out for the year” if they … don’t. At the very least, the team has to be ready for the possibility that at some point, they will have to make do without Wright for a long stretch. The team surprised most fans and commentators by cutting Ruben Tejada in the middle of Spring Training. This is likely a financial decision–they now pay Tejada just $500,000 instead of his full salary of $3 million–but it has a significant impact on the shape of the infield depth and how the Mets can weather a medium- to long-term injury. Tejada has never been a great player–he’s barely ever been a good one–but his 1.9 WARP in 2015 puts him damn near close to league-average, with just 407 at bats. He’s obviously no long-term third baseman, but if Wright goes down, that leaves an average-sized hole in an otherwise deep roster. The most likely candidate to take over the hot corner is Wilmer Flores. There has been buzz about Neil Walker being moved over and Flores slotting in at second base, but Walker logged barely 100 innings in that spot–with the most recent stint coming back in 2010–so Flores has an edge in both experience and in general defensive ability. With Flores locked in at either position and Ruben Tejada now wearing Cardinals red, the Mets are suddenly in need of a backup shortstop. Assuming (and hoping) the team doesn’t consider Eric Campbell’s 22 professional innings at shortstop to be sufficient qualifications for the role, they will turn to the last shortstop standing on the 40-man roster, Matt Reynolds, to round out the Wrightless 25-man roster. So what does this infielder merry-go-round mean when it comes down to wins and losses? PECOTA has the team pegged at a 90-win season with Wright logging 2.5 WARP over 531 plate appearances. In this model, Flores gets 420 plate appearances (172 at third base) with 1.6 WARP and Reynolds gets 114 and barely cracks replacement level at 0.1 WARP. Let’s try another perspective. Assume Wright misses half the season instead–for comparison’s sake, he missed 124 games in 2015–and around 250 of those plate appearances have to be covered elsewhere. His projected WARP then drops to 1.3. If Flores adds roughly 110 plate appearances to his total, with another 110 being diverted from the “super sub” role he’s currently filling, this adds 0.4 WARP to his season. The last 30 PA would likely be covered by Eric Campbell, who is close enough to replacement level that the change to his WARP is basically negligible. As Matt Reynolds is also essentially replacement level, his filling in those 110 plate appearances Flores is not getting as a backup doesn’t add a meaningful amount to his WARP either. When we crunch the numbers, starting from a 90-win season and subtracting 1.2 wins with Wright’s extended absence and adding 0.4 from Flores, it costs the Mets around one win and leaves them with a projected 89-win season. Not a terrible impact on paper, but as any Mets fan knows, one game can be the difference between bliss and agony. Moreover, PECOTA pegs Washington at 87 wins, so as it is, the Mets hold the narrowest projected lead in the National League. This is where the loss of Tejada really shows up, as he could easily add 0.5 WARP over Reynolds which is significant in a race this tight. There are major implications for the team across the entire range of outcomes for Wright. Missing nearly the whole season could easily cost them two full wins. If Asdrubal Cabrera also misses time, forcing Reynolds or Campbell into a starting role, then we start to get into wacky “What about Amed Rosario” territory and there ain’t no math for that one. On the other hand, if he stays on the field for his projected 531 plate appearances and performs at the same level he did last year, he could add a win or even two over current projections. Allowing for a range of 89 to 92 wins is a big difference for one player–especially for one who isn’t projected to put up especially high numbers–and there’s no doubt that swing could completely redefine the Mets season. 92 wins is champagne time; 89 wins is nail-biting time. And with Wright traveling in uncharted territory in regards to spinal stenosis treatment following a unique exercise and rest regimen designed for him by his neurosurgeon Dr. Robert Watkins, neither the best minds nor the fastest processors can say where he’ll be come September. Or, for that matter, October.